Dr. Abdelrahim completed pharmacy training followed by graduate work in the field of pharmacology and toxicology. Upon completion of his graduate work, clinical training as a medical oncologist fueled his motivation and expertise in the field of anticancer drug discovery. His translational research is focusing on the discovery and development of new anticancer drugs. He has identified for the first time a new structural class of compounds that can target selective transcription factor called Sp proteins. Transcription factors are now recognized as targets for the development of new anticancer drugs. Dr. Abdelrahim's research has pinpointed few compounds that inhibit tumor growth and angiogenesis in-part by inducing proteasome-dependent degradation of selected Sp proteins in cancer cells and tumors. The lead compound of this class (Tolfenamic acid) has reached Phase I Clinical Trial to treat patients with advanced and metastatic pancreatic cancer in combination with gemcitabine and radiation therapy. Dr. Abdelrahim has a patent application submitted for the new use of these compounds in GI cancers. In prior research, he was the first to find that Sp4 protein is over expressed in GI cancers including pancreatic cancer and that the role of Sp4 can be equally important as Sp1 in some type of GI cancers. Researchers in cancer have the ultimate responsibility of taking their findings to the clinic which is described as translational research. 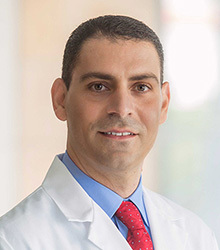 By seeing GI cancer patients in his practice, collaborating with translational scientist in the lab and conducting and directing clinical trials, Dr. Abdelrahim hopes to continue to fuel the translational research cycle from lab to clinic and back to the lab. Membranous nephropathy in autologous hematopoietic stem cell transplant: Autologous graft-versus-host disease or autoimmunity induction?